After experiencing a failed traditional FUE procedure that used a basic rotary punch and further bad results from a scalp micropigmentation (SMP), this African American man sought the help of Dr Umar, a world renowned hair transplant surgeon located in Los Angeles, CA. 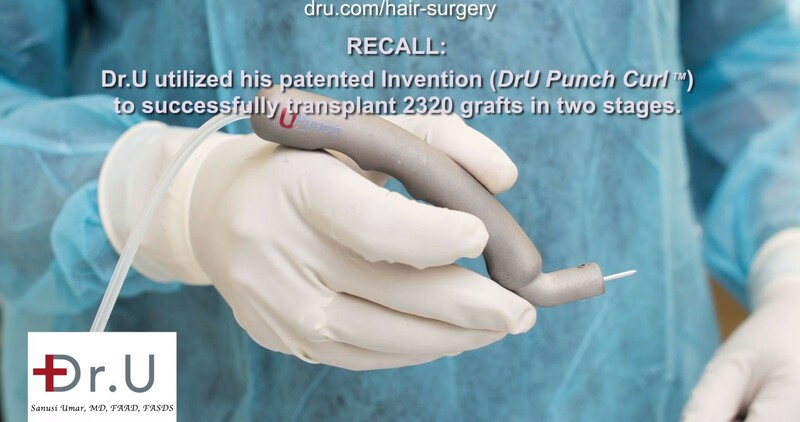 Dr U has invented a FUE tool called the DrUPunch Curl, specifically designed for performing FUE hair transplants for black men and women, regardless of hair curliness or skin texture. In a recent Plastic and Reconstructive Global Open Journal publication, Dr Umar showed that where other punches have failed, the DrUPunch Curl is successful in extracting any and all Afro-textured hair. 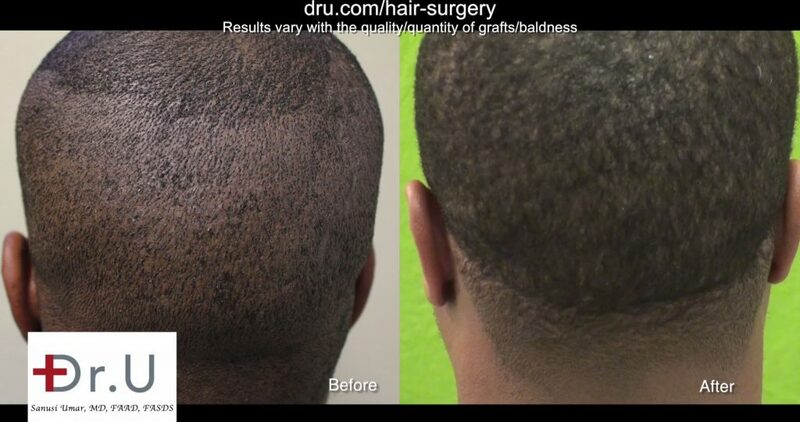 In this patient, Dr. U transplanted a total of 2,320 grafts in a two-stage procedure. 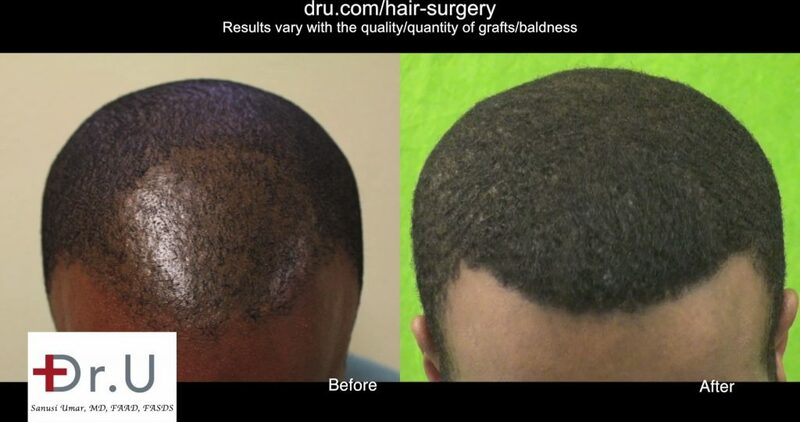 DrUPunch Curl — the best tool for FUE hair transplant for black men and women! 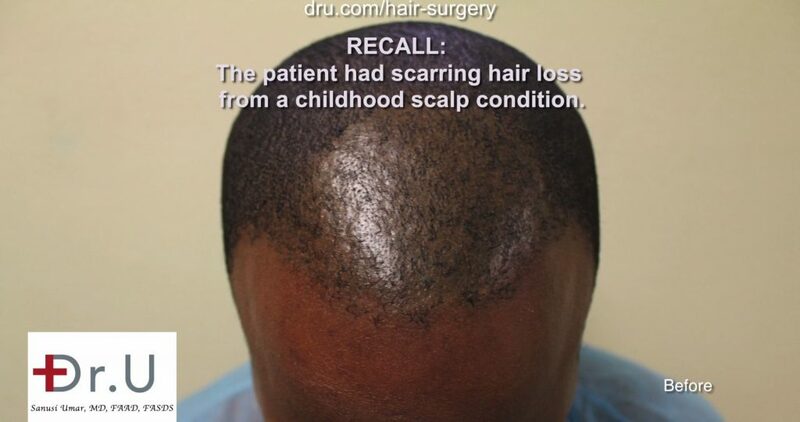 Prior to discovering the BEST TOOL FOR FUE Hair Transplant for Black Men, this patient had scarring hair loss from a childhood scalp condition. Dr. Umars patented DrUPunch Curl tool, used for black African hair transplant. Dr Umar using his DrUPunch Curl, the Best Tool for FUE Hair Transplant for Black Men. Frontal view before and after visiting Dr. Umar. Results after the DrUPunch Curl tool repaired poor FUE outcome from another clinic. You save in cost by having it done properly the first time. Oblique view of the patient’s successful outcome after the best FUE hair transplant for black men. The patient’s donor area after undergoing DrUGraft FUE hair transplant for black male. 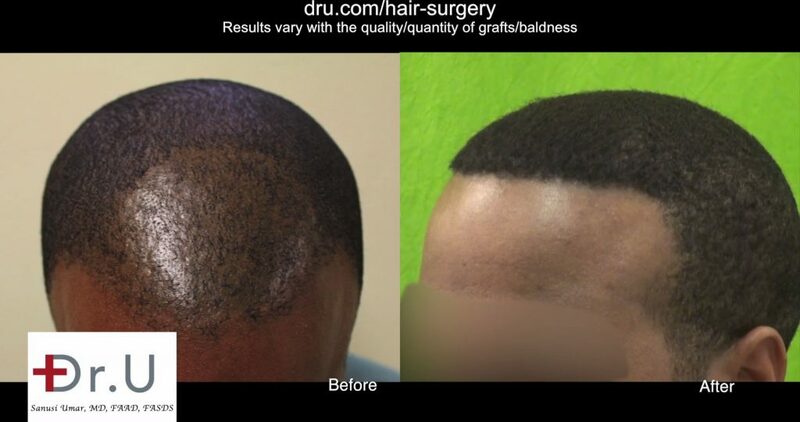 The success of the DrUPunch Curl in treating this patient, as well as many others, has earned the DrUPunch Curl the reputation as the best tool for FUE hair transplant for black men available today. It offers satisfaction that other FUE tools cannot. The before photos are after having SMP scalp micropigmentation done? Yes, the before photos are AFTER having SMP scalp micropigmentation done at another clinic. Really impressive work and results Dr. Umar. Whenever one is perusing for which clinic to choose you notice that many clinics are not able to have successful restorations for African American patients. This speaks volumes.